Neck roll pillows are an amazing product. However, the quality of the pillow is very important and remember - price does not always indicate the quality! I advise all my clients with neck pain and upper back pain to use a well-fitted neck pillow. The aim of the neck roll pillow is to support your neck in its correct position while sleeping. It is designed to fit the shape and size of your neck curve. This implies that it is very important that you are correctly fitted for your pillow - to ensure that you have the correct size for your neck. 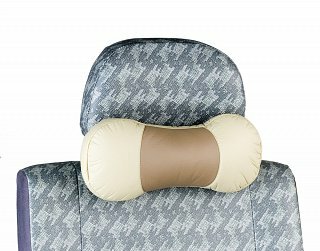 I have seen occasions where a poorly fitted neck roll pillows has done more harm than good - typically where the patient’s neck has been pushed out of its correct alignment by the pillow, causing delay in recovery, injury and pain. 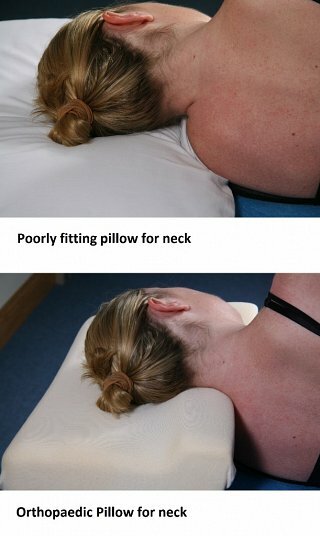 A normal and orthopaedic pillow - see the difference in the neck alignment? The natural curve of your neck goes inwards, allowing a gap between the back of your head and your pillow when you lie down. In a perfectly designed and healthy spine, your body has the ability to change shape when you sleep on a normal pillow. However, if you suffer from stiffness or pain in your neck or upper back, then your necks’ ability to change when you rest is reduced - and so you may develop pain from the strain placed on your neck while sleeping. A properly fitted, and good quality neck roll pillow, will rise to meet the gap between your neck and the flat part of the pillow - and in doing this will support your neck in a restful position while you sleep. This will allow your neck and upper back to recover from carrying the load of your head all day and prevent pain in the long-term. A good orthopaedic pillow will actually treat you while you sleep! However the most important aspect of your neck roll pillow is that it is tailored and specific to your neck curve. Seek advice from a chartered physiotherapist for the best result.